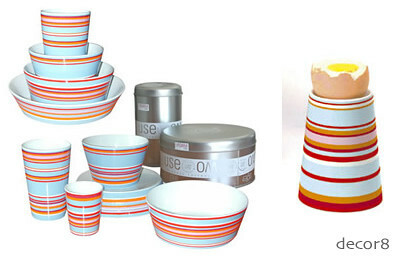 Berlin designer Birgit Jobst and the Design House of Germany introduce Stripes, dishes that perform double duty! A mug holding coffee can be flipped over and used as an egg cup. A tall bowl easily converts from holding your lucky charms to, flip! a fruit cup. The clean modern design appeals to me, but having dual serving options is a real selling point. Can't resist the happy colors! A slice of fresh orange combined with tranquil blue adds the perfect combination of zest and calm to any breakfast table. If you prefer to see spots over stripes or perhaps funky forasetti plates or the studio dror vase of phases (smashing, aren't they? 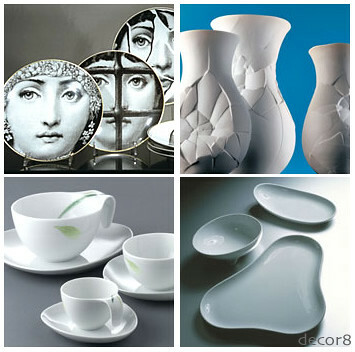 ), visit eTabletop. They're dishing beautiful collections like the lemon grass from rosenthal or the sculptural innovative designs from ole jensen for royal copenhagen. Furniture Shopping - Oh Joy!